Saga of a Photo, directed by Mooly Landesman, tells the fascinating life story of Margot Klausner -- a woman of great courage and vision, who is credited with being among the founders of the Habimah National Theater in the 1930s and responsible for the building of the first film studio in 1949. Based on her diary entries, family photos, home movies, personal letters, and using dramatic re-enactments, her granddaughter tells the story of her life in this extraordinary documentary film. 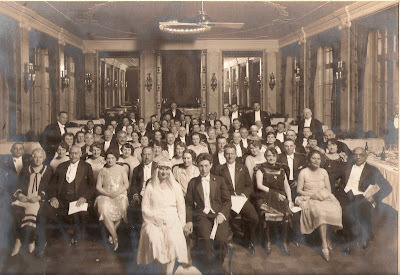 The film begins with this photo of Margot's wedding in 1926 Berlin to her first husband, Jacques Rosner. During their honeymoon in Palestine, it is already clear that the young and elegant Margot is excited about the possibilities and challenges of life in Eretz Yisrael. Her father owned a shoe factory and a chain of shoe stores throughout Europe. She becomes involved with the Habimah actors who came to Berlin in those years and builds a special relationship with the manager, Yehoshua Brandstatter. At that time, the actors were not all convinced that they wanted to make aliyah. But Klausner and Brandstatter prove to be a formidable team, and using some of her family money, they bring the theater troupe to Tel Aviv where they establish the national theater and are part of its management for nine years. At this time Klausner and Brandstatter participate in their first film production -- the production of a remarkable landmark documentary film, Land of Promise, with original songs composed by Natan Alterman, which won first prize for documentary film at the Venice Biennale. After the establishment of the State, they go on to use their personal resources to establish the first major film studio in Israel. The ground was broken for the new building in 1949, and the film laboratory and sound stage were opened in 1952. The film also includes the personal side of Margot's life. She had two children -- Miriam, the daughter that she had with Jacques, and Amos, the son that she had with Yehoshua. Miriam's husband, Tzvi Spielman becomes the technical director of the Herzliyah Studios. Through the life of this remarkable woman, we are offered a glimpse at the history of Israeli theater (with vignettes from early Habimah productions) and milestones in Israeli filmmaking (with scenes from early productions such as Hill 24 Doesn't Answer). In the 1960s, filmmaking in Israel becomes a bigger business, and the Studios were involved in the production of many important Israeli films such as The Boy Across the Street, I Love You Rosa, The Policeman, Sallah, and Peeping Toms, not to mention the thousands of documentary films, TV productions and newsreels that were processed in the studio labs. Margot Klausner was a woman with a vision. In a country where cinema was not yet considered a cultural art, Klausner realized the importance of developing a film industry. At the cornerstone-laying ceremony of the studios (July 3, 1949), the statement of goals included: It is the aim of the founders of these Studios to draw the attention of the nations towards our way of life in Israel, through the aid of movies, an art which has such a great influence in the world and reaches into all countries. The documentary film, Saga of a Photo (documentary, 80 minutes), is a fascinating look at the life of one woman, combining the personal with the national stories. The film is available from Ruth Diskin Films. in a business like, albeit friendly manner. She had true insight in relating to everyone and took great care to ensure we were happy in our chosen profession. based in Givatayim. Micha Adelman.